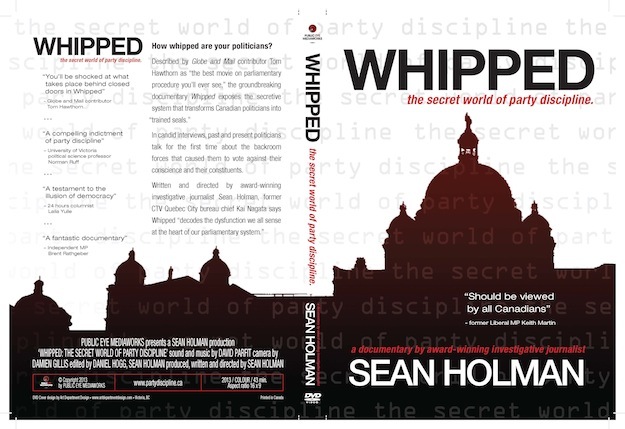 Today, I’m extremely pleased to announce DVDs for Whipped: the secret world of party discipline have been finally been printed. You can check out the cover — created by Victoria-based graphic designer Victor Crapnell — above. The first copies have been ordered by Alberta’s Legislature Library, Douglas College and Fair Vote Canada’s Waterloo region chapter. This entry was posted in Announcements on February 7, 2014 by Sean Holman. So can I order a copy to show in our local community? We have an election coming up in a year or so, and it seems appropriate to get people thinking about this at an early stage.